Major applications of esthetic lasers include(can be divided into) treatments in high demand such as tattoo removal, laser resufacing, hair removal, body contouring, and skin tightening, etc., or treatments of high necessity such as laser for nevus inflammeus, and nevus of Ota, etc. Surface ablation has long been in use in the forms of dermabrasion, chemical peeling and crystal peeling; procedures that are high in demand. Wrinkle and scar treatments were constantly in high demand and have been considered important in the field of aesthetic treatment. However, before the advent of laser, they were not easy procedures to master and required experience as well as trial and error on the part of the clinicians. Existing ablative methods were not standardized, difficult to learn, and varied greatly in therapeutic effect depending on the doctor. Moreover, the risk of side effects still existed with an unexperienced doctor. Although laser therapy may not grant equivalent outcome regardless of the doctor, it was relatively easier to learn and more suitable for standardization compared to the existing procedures. Doctors also preferred laser therapy to the existing treatments when learning new procedures. Naturally, the ablative laser soon came to be widely accepted. The existing methods involved mostly physical or chemical exfoliation of the skin surface. Among them, dermabrasion, which used an abrasive tip driven by a high-speed rotary hand engine, had a high risk of side effects as the depth of abrasion was determined only by the operator’s intuition and experience. Passive treatment, for fear of side effects, would result in less therapeutic effect. In chemical peels, the depth of ablation is controlled by the type, concentration and exposure time of the substance used, which are difficult to be standardized due to different responses among individuals, races and treatment sites. There were even some doctors who used sterilized sandpaper, not a mechanical device, to smooth the skin as if it were a piece of wood. Some cases achieved good results, but this method could not be used widely. It would be safe to say that the history of ablative laser started with CO2 laser. The CO2 laser was first developed in mid 1960s, but started to be mentioned in clinical studies mostly as a surgical tool from the 70s. It was often referred to as the ‘Light-Knife’ used across various procedures in the fields of neurosurgery, gynecology, general surgery and otolaryngology. Its popularity came from the ability to adjust the incision and coagulation by pulse width and fluence. In the meantime, Strivastava reported resurfacing eschar from burns and skin transplantation in 1981 (J Trauma. 1981 Srivastava RK, MacMillan BG, Kahl JB. A challenge to resurface major burns. Apr;21(4):307~12). The Continuous Wave (CW) CO2 laser, which was used mostly for incision at that time, started to be applied to make wide and uniform skin surface. Although the result was good, it was accompanied by side effects such as redness, edema, hyperpigmentaion, hypopigmentation, infection and scar. 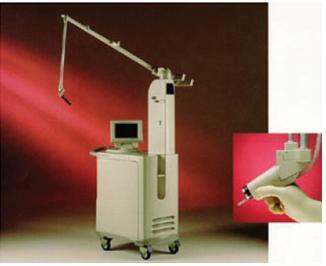 In 1989, Spadoni reported using CO2 laser for facial resurfacing for the first time (Spadoni D, Cain CL. Facial resurfacing. Using the Carbon Dioxide Laser. AORN J. 1989 Nov;50(5):1007, 1009~13). CW CO2 laser leaves an unpredictably large area of tissue damage, making it difficult to anticipate side effects accurately. In the early days, manufacturers of ablative CO2 lasers and doctors believed that neat exfoliation of the skin and minimal residual damage would be desirable. Therefore, the goal was to develop a laser that can exfoliate the skin to a proper depth without leaving residual damage. Two methods were presented: one was pulsed CO2 laser with pulse duration of less than 1ms, and the other method avoided irradiation of laser light to one spot for a long period of time (shorter dwell time) by using scanner with CW CO2 laser. From the early 1990s, companies started to release CO2 lasers with a shorter pulse duration. Among them, Ultrapulse (Coherent, currently Lumenis) is still in the market, and others included TruePulse (Tissue Technologies) and ClearPulse. Silktouch and Feathertouch (Sharplan) were the representative lasers equipped with a scanner. Compared to silktouch CO2 laser, Ultrapulse yielded a superior clinical effect, which is why it is the only one among these lasers to remain in the market. The main indications of pulsed CO2 laser for ablative resurfacing include resurfacing of photodamaged skin, wrinkle, acne and small pox scars, as well as deep dermis lesions, such as syringoma, and simple mole removal. As was with most other aesthetic lasers, an ablative laser device was first constructed based on the basic data from computer modeling or physical calculation. If the published clinical results were positive, studies investigating the reason of such results were performed. Many studies focused on laser resurfacing with UltraPulse and concluded that a certain degree of residual damage in the dermis stimulates fibroblast leading to collagen remodelling (Ross EV, McKinlay JR, Anderson RR. Why does Carbon Dioxide resurfacing work. A review. Arch Dermatol. 1999 Apr;135(4):444~54). This study provides the key for understanding ablative resurfacing and the later developed non-ablative resurfacing, thus is worth reading. Despite the very good effects of CO2 laser, a long downtime after a procedure and discomfort from redness lasting for 1 to 6 months limited the number of patients. 2940nm Er:YAG laser was launched and boasted relatively less residual damage (20-50um, 60-100um with CO2 laser) and faster recovery. Compared to 10600nm CO2 laser, 2940nm is highly absorbable to water and is delivered to part of the epidermis, with very small penetration depth. Such mechanical properties and theoretical effect, combined with a markedly lower price compared to existing pulsed CO2 laser, drove up sales of Er:YAG in Korea. It was widely utilized for ablative resurfacing between late 1990s and 2000s. A limitation of Er:YAG laser is the failure to induce tissue shrinkage and coagulation. With later reports on the clinical effect of Er:YAG ablative laser arising only after a sufficient passage of time, it was concluded that ‘reversible damage zone’ was needed for clinical effect. This conclusion led to the thought that the clinical outcome might be different from that of Ultrapulse CO2 laser, because Ultrapulse resurfacing showed gradually better outcome in 6 months and 1 year after procedure, compared to immediately after procedure. To make up for the shortcomings, Er:YAG lasers with longer pulse width (about 1ms) were released in the early 2000s, and one of them was called CO3 (Cynosure). One may guess there was heated competition between Er:YAG laser and CO2 laser. 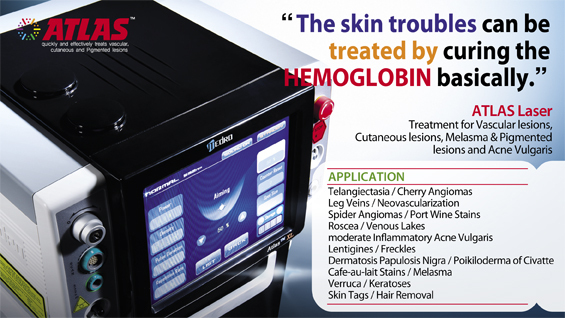 Other Er:YAG lasers with longer pulse width include Derma-K (Lumenis) and Contour (Sciton). In the 2000s, laser manufacturers faced another challenge as the goal of surface ablation shifted from non-scarring exfoliation and regeneration of the skin to collagen regeneration at the dermis. While manufacturers were grappling to determine the next move, a ground-breaking laser emerged in the market. This new laser irradiated 1320nm laser light while simultaneously cooling the skin surface The skin surface temperature was measured to estimate the dermis temperature. Theoretically, it provided an ideal solution as it was said to not inflict damage to the skin surface, causing no interference with daily life, and to stimulate the dermis, allowing for a reversible damage zone. Once marketed in the name of ‘Cooltouch’, the laser was sold widely around the globe but, unfortunately, positive clinical evaluation was only short-lived. Nevertheless, the advent of Cooltouch provided a new breakthrough in the development of aesthetic laser around the time when the demand for ablative lasers was sharply decreasing. Few patients wanted to endure a long downtime and half a year of redness, however superior the effect. The number of new patients dwindled and so did the number of new purchases of the high-priced device. The success of Cooltouch provided a new direction for overcoming such a difficult time for other laser manufacturers and investigators. Initially, laser experts, including Rox Anderson, officially raised questions regarding the therapeutic effect of the non-ablative method. With the introduction of terms such as ‘Non-ablative Resurfacing’ or ‘Subsurface Resurfacing’, a variety of other lasers were developed and their therapeutic effect was gradually improved. Later, devices using ultrasound or RF were developed, a stepping stone for these devices taking important positions in dermatological aesthetic treatment. Lasers with the idea of ‘Fractional Photothermolysis’ were also developed in this context, highlighting the significance of Cooltouch.